London Fashion Week’s plethora of designer talent all upped their game this season. After seeing images, and attending shows during the trade show which will see £100 million of orders, I can honestly say every designer has improved themselves. J JS Lee was one of them. Showing at 9:00 am on Friday morning to a bunch of Londoners and bleary eyed jet setters, her collection was sublime and potentially her best to date. Why? 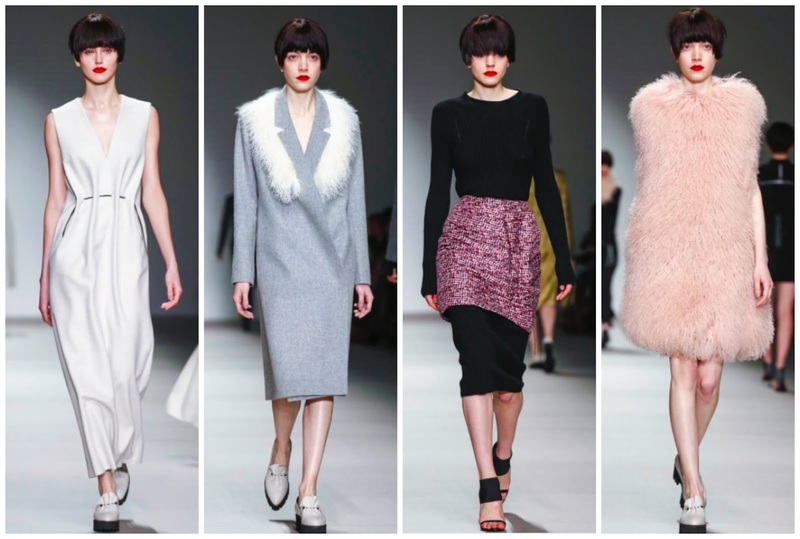 It was true to her minimal ethos but given a funky zest via prints, fur and a plump red lip. Jackie’s colours of choice for Fall 2015 - many shades of grey (not 50, like the raunchy film), white, black navy, dusty pink, a deep mustard and dark pinks. There was a sensuous vibe to the clothing this season. Deeper necklines, higher waistlines, fir coats with who know what underneath. It was all fabulous. I loved Look 6. A wool sweater worn with high waisted elasticated trousers. Look 15 was another standout. A grey sculpted coat, with fur lined lapels. The model that stormed the runway after that was bundled up in a luxurious grey wool high neck sweater with a simple white panel. Grey trousers - suitable workwear or day-to-night piece - also livened the look up. This mixture of greys, prevalent throughout the start of the collection added depth to the looks. One grey may be conceived as boring but two or more ignited the look. Tomboyish overtones were present in the collection. Models wore bobs that contrasted with their red stained lips. Tomboyishness was done with slightly oversized coats, but with a feminine touch. Printed pinks were worn over wide leg black trousers. Dresses were disguised in long tuxedo like overcoats. The hair and make-up was an aspect of the collection which really hit home with me. They eye catching crimson lip and the perfectly manicured bob propelled the androgynous theme. After seeing such amazing clothes from London designers this season, one can only hope that this winning streak continues. With almost five years experience, Jackie is garnering much deserved attention opening London Fashion Week for the past couple of seasons. I always am intrigued to see what the CSM grad has to present and this season I was enamoured to say the least.